For one week only, more than 400 design-related events, public projects, and installations take over the city. There are eleven official Festival design districts to explore and six special projects at the V&A, which, this year, celebrates its 10th anniversary as the official London Design Festival hub. At the very heart of the Brompton Design District, the V&A is a natural starting point. As the main hub of this year's festival, London's greatest museum of fashion and design hosts five special festival projects and a breadth of LDF related workshops, talks and displays by some of the world’s most innovative contemporary designers. Look out for Pentagram x 14-18 Now: 'Dazzle': a creative studio at the heart of the V&A transformed for the occasion by 'Dazzle', a monochrome abstract design used as camouflage during WW1. Pentagram has designed an immersive experience that seeks to inspire yet evoke the horror and disorientation of the WW1 war ships. The V&A's Frida Kahlo retrospective is a must-see exhibition; but on no account should you miss the London Design Festival projects installed for the occasion. Among our favourites are Multiply – the interactive, 3-D wooden maze by Waugh Thistleton Architects in the Sackler Courtyard at the V&A – and The Onion Farm in Room 94 of the V&A's Tapestry Galleries. Surrounded by ancient tapestries, the 25m long spinning sculptural installation by Danish fashion designer Henrik Vibskov (above) casts a new light on the juxtaposition of old and new. This year, to mark the London Design Festival's 10th anniversary, there is also a major collaboration between Natural History Museum, Science Museum, Design Museum, Imperial College London, Brompton Design District and the V&A to pedestrianise a section of Exhibition Road on Sunday 23 September 2018 for a free day of activities. Pick up a little red book from the entrance hall detailing the V&A's extensive programme, or click here for the full London Design Festival 2018 programme. This year, there are six London Design Festival Landmark Projects across the city: Alphabet Kellenberger-White (Broadgate); Mint Street: Michael Anastassiades Studio (Mint Street); Multiply: Waugh Thistleton Architects (V&A); Please Feed the Lions: Es Devlin (Trafalgar Square); Time for Tea: Scholten and Baijings (Fortnum & Mason); Trace: Architecture Social Club (Regent Street). They are all wonderful but we've fallen head over heels for Es Devlin's Please Feed the Lions. On Monday 17 September a fifth lion will join the pride of Trafalgar Square. The fluorescent red, interactive installation is the result of a year-long collaboration between internationally renowned set-designer Es Devlin and Google Arts & Culture. However, unlike the pride, Devlin's lion roars poetry – the words he roars will be decided by the public, who can 'feed' him suggestions at anytime, day or night. 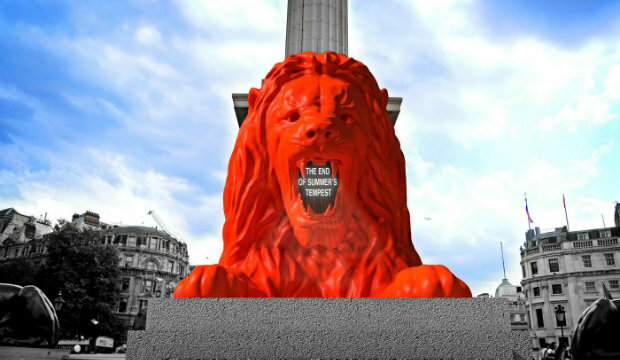 During the day, poetic phrases will be displayed in the lion's mouth, by night, they will be projected onto Nelson's Column. Devlin's immersive lion sculpture sees history, design, machine learning and the creative arts merge as one. Devlin is also showcasing an immersive installation The Order of Time at Bold Tendencies in Peckham on 22nd September, in which she combines spectacular audio and visual elements with the words of physicist Carlo Rovelli, read by Benedict Cumberbatch. Michael Anastassiades explores contemporary notions of culture and aesthetics through a combination of product, furniture and environmental design. We absolutely love his minimal, utilitarian designs that are imprinted with an unexpected vivality, and his stripped back lighting for which he has become famous. For London Design Festival 2018, Anastassiades has created two beautiful eco-friendly projects: he has partnered with Lisbon-based experimentadesign to pave a secluded street in Southwark in a carpet of recycled marble; and designed a public fountain for The John Madejski Garden at the heart of the V&A. The design is conceived 'as an elegant, enduring and robust addition to public spaces that can be used for refilling botles as well as drinking'. Designjunction – the cutting-edge interior design show, now in its eighth year – takes over South Bank this September. Exhibiting some of the best national and international brands in art and design, expect to see everything from furniture and lighting to technology installations and fashion accessories. With three locations (Doon Street, Riverside Walkway and Oxo Tower Wharf & Bargehouse) showcasing more than 200 brands, Designjunction is the best place for browsing (and buying) affordable contemporary design pieces. Get ready to be inspired. If you've an eye for an interiors bargain, then these might just be the shows for you. 100% Design is the UK's largest trade event aimed at designers and architects. With more than 400 UK-based and international brands, and a vast range of interior design products, 100% Design is a great place to spot new talent and discover emerging trends. As one of Europe's leading design fairs, Decorex International offers an unparalleled opportunity for interior designers, architects and property developers to discover the finest furniture, lighting, textiles, craft and accessories from emerging and established names alike. Showcasing over 500 designers, this four-day trade fair in the heart of East London draws its talent from across the globe. Hosting a vast collection of international exhibitions, designers, brands and country pavilions, at the London Design Festival, London Design Fair has seamlessly established itself as the go-to trade event during the week. There are hundreds upon hundreds of events to choose between during London Design Festival, and almost all of them take place across the eleven official London Desgin Festival districts, spanning the capital: Brompton, Clerkenwell, Shoreditch, Mayfair, Pimlico Road, Fitzrovia, West Kensington, Marylebone, Victoria, Regent Street & St James' and Bankside. These districts are city-wide hubs with distinct concentrations of local LDF activity and can be traversed easily on foot. Peruse the LDF website for a comprehensive schedule of events. In addition to the eleven official design districts are three official Design Routes: Paddington, Brixton and London King's Cross. Introduced in 2017 to recognise smaller clusters of design activity, these three Design Routes boast a plethora of events, talks and product launches. All Design Route Trail events are within walking distance from one another. As part of the King's Cross Design Route, Tom Dixon hosts Electroanalogue in his new HQ and flagship at Coal Drops Yard. Electroanalogue explores the realms of digital technology through a series of events, installations and interventions. Building on the success of its inaugural edition in 2016, London Design Biennale, 2018, returns to Somerset House this September with more than 40 participating countries, spanning six continents. Each exhibiting country will present ideas, artworks and installations that respond to the theme of 'Emotional States', and explore the complex relationship between contemporary design and the environmental, social and emotional issues we face each day. This retrospective is a blockbuster tribute to the genius of a designer who dealt not only in haute couture, but in timeless beauty.